True story: Sega's Space Channel 5 is one of my all-time favorite games. It's one of the few games I've purchased for my beloved Dreamcast--along with ChuChu Rocket!, Jet Grind Radio, Virtua Tennis and a few others I can't remember right now--and it's also one that I never tire of playing. 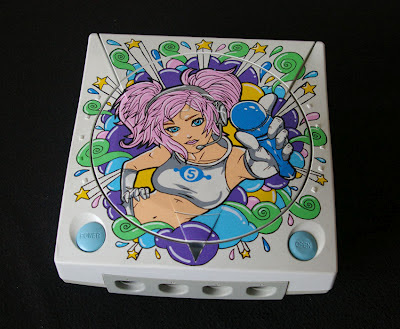 Given that, it should be of little surprise to hear I've been drooling over the Ulala-branded Dreamcast below ever since I discovered it a few days ago. An artist who calls himself Oskunk is responsible for this wonderful paint job, by the way. To see more photos of this particular project, check out his (her?) blog, custom-art.blogspot.com, or his Flickr photostream. Yeah, Justin, this guy does some *awesome* stuff! On another note, just discovered your blog. Love it. Look forward to future posts. Anyway, I'm glad you found this blog--and I'm glad to hear you're enjoying it so far. As for owning/playing Space Channel 5: I'd highly recommend both if you have a Dreamcast and like collecting for it. Space Channel 5 Part 2 is worthwhile, too. What Dreamcast games do you have at the moment, by the way--if you don't mind me asking? And which ones are your favorites? I definitely want to check out the game someday for sure, just gotta find a copy of it. It's a bit easier with Dreamcast games than with other systems that I collect for, like SNES, because the case itself can be swapped out. Just sometimes I have bad luck with ebay and get a disc that's a bit scratched up, some of them come really scratched, but all of them generally work in the end. As far as the collection goes, I don't have a ton yet. Still working on college so gotta be really picky about what I buy when I have spare cash. My goal is to someday have the entire collection, as it's not too many games compared to other systems. Dreamcast actually is what got me into collecting, my original goal was to collect the entire library but just got distracted with other systems. Got a little side-tracked. I went for games that I was super interested in having, and knew that I'd play a ton, mainly Resident Evil 3 and Resident Evil Code Veronica, Legacy of Kain, Star Wars Podracer, things like that. Got Jet Grind Radio a while back. I'm not very good at it but I remember playing it as a kid so there's some nostalgia there. Oh, yes, check out these games (the Space Channel 5 ones) at some point. You should be able to pick up a copy of the first one fairly cheaply, I believe. The second one likely will be more expensive, especially since it was only released in Europe and Japan, as far as I'm aware. I'm not very good at Jet Grind Radio either, by the way, but I'm still glad I own it, as I love the graphics and music and overall gameplay. Maybe someday I'll really focus on it and try to get better. That's interesting, Simon. Why aren't you all that interested in this genre? I have to say, I think it's worth checking out even if you're not into such games.